No. 1 Florida State re-emerged in the second half and rallied to defeat No. 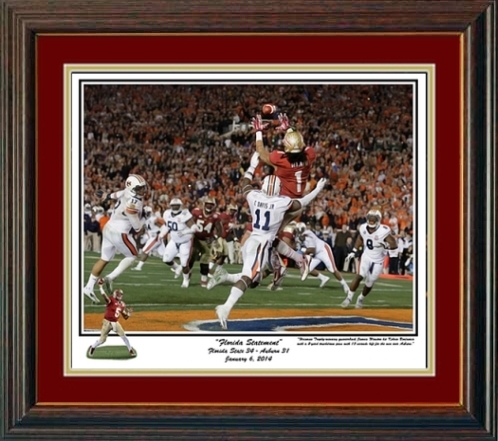 2 Auburn 34-31 in the 2014 BCS National Championship football game at the Rose Bowl in Pasadena, California. 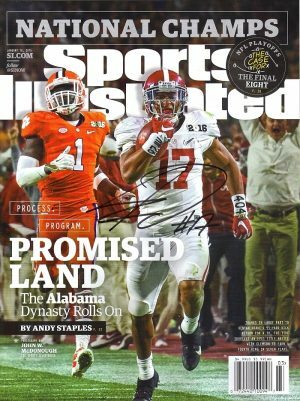 The Seminoles (13-0) outscored the Tigers (12-2) 24-10 after halftime to win their third national title. It was FSU’s second BCS crown and third national title. and is signed and numbered by the artist. This print has been Professionally framed in a 1 1/2″ Dark Cherry Moulding with a gold lip and Garnet Suede and gold matting with glass and backing. I measures 14 1/2 x 16 1/2 and is ready to hang!! !